Increase social shares on posts ~ 3 killer (UNTAPPED) ways! →Increase social shares on posts ~ 3 killer (UNTAPPED) ways! Do you want to Increase social shares on your blog post? Ok I want to discuss 2 powerful yet untapped ways to help your readers share your articles. We know social media is an unfailing channel to pull traffic to your blog posts. While you are encouraged to build a huge social media presence by growing your friends and followers, technology has given us multiple ways to tap into this traffic gold mine even with a proven weak social base. There are well known methods to increase social shares on your articles. One of these is Influencer Marketing (also Influence Marketing). It allows you to dig deep into what others have done by simply tickling them into sharing your articles. While Influence Marketing can generate immeasurable results, there are often hidden methods successfully used by some bloggers. Traditionally, adding social media buttons to your blog increases sharing. These are different types and designs. While some themes like MyThemeShop themes come with inbuilt social sharing features, you will have to install additional plugins for most of the themes in the market. Readers may just skip over those buttons and forget to share. So it’s recommended to ask them to share if they like the content. Note however that readers don’t just tweet or share because you ask. Your article has to be interesting and shareable to cause them to share. But this works exceptionally well for the top social media platforms. You can remarkably increase social shares by embedding Facebook Posts, Twitter Tweets, Google plus posts into your blog posts. You may want to try out this embed code generator but the simplest way I have found is to click the Options Menu -> Embed Post to grab the code. Once you click on Embed Post, grab the code and paste on the source view of your article. The default width of the widget is 500pxl but if you have some coding knowledge, you can change that to fit your design. Maybe Facebook should give us an easy way to do this (or I just didn’t see it). It is visibly clear from the Facebook embed above that your readers can easily like, comment and share your posts. Once you click to generate the Embed code, simply grab the code and paste on the source view of your article. You notice that your readers can comment, Plus and even follow you directly on your blog posts without having to switch to Google plus domain. Twitter has also made it simple to embed Tweets on your blog posts. Simply identify the tweet you want to embed, click the Menu -> Embed Tweet. Once you click to embed Tweet, grab the code as well and paste in the source view of your article. Here is a sample embeded Tweet ! At this level, it is interesting to note that your readers can follow you, retweet your tweet, reply and add your tweet to their lists without leaving your blog. However, you cannot return to your Facebook profile to embed old posts. You may have to use their code generator. The Embed Post option disappear from old posts. On Twitter and Google+, you can always return to old posts and grab the embed code easily. Facebook allows you to adjust the width of the embed widget by changing some source code values. This is not the case with the other two networks. 2 – Shareable Quotes and Phrases. One of the ways to increase social shares on your blog posts is to use plugins that allow your readers to easily tweet or share quotes and phrases embedded in articles. As I write this post, there are good number of plugins to add tweetables to your posts. One of this is TweetDis. NB: I recently wrote about this plugin so check out this post for details. The problem I have with TweetDis is the fact that it only works with Twitter. I however suggested to Tim Soulo to include other networks like Facebook (shares) and Google +. TweetDis has a rich variety of themes and design. It has quite awesome level of flexibility. Check out my review for more. 3 – Reward your readers. Everyone desires to be rewarded for an action. If you give access to an important reward to your readers who share your content on social media, you are definitely going to get more shares. Today, we have tools like JustRetweet, EasyRetweet, PaywithaTweet, etc that allow you to pay your readers with a certain value when they carry out social actions on your blog posts. With Paywithatweet, your readers will have to tweet or share your link before having access to another page where they get the reward. This can be used to create an unending viral effect on your pages. Simply, you may allow readers to tweet your link to unlock access to a discount code or free download page. The form is actually simple. This tool supports up to 6 different social media networks. You notice that you set the message to be tweeted or shared, the url to along with it and of course where the reader will be redirected to after sharing. This should be a hidden URL for free product download, coupon code or some premium content. Generally, search engines should be stopped from crawling such pages so that your content doesn’t get delivered to the public through natural search. Simply grab the embed code and paste on your article source view (b). 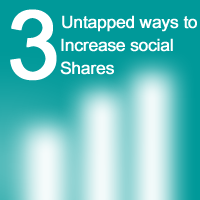 These are some 3 smart ways to increase social shares on your blog posts. If you like this post, please share it on social media. Do drop a comment and let me know what you think! Interesting post buddy, I love using Tweetdis, I also love using inlinetweets. The above two methods are really beneficial. I’ll be testing these to see how stuff works. Every-time I come here I always get unique ideas like that. And when I put them into user I get effective results. Thanks for the sharing. One way what I am using is – Social locker. It is a great tool to increase the social share on the blog posts. What don you think Mr. Enstine about Social Locker Pluging? I know that embed features in social media but I’ve overlooked it. But I liked your Twitter part mostly. It’s another awesome post from you man. I’m eager to read to lot more now. I have done some embedding of twitter posts on my blog a while back and sure with quotes, I go big with that all the time. Would like to try them all again. Thanks for sharing. Have a blessed week. the number of social shares on my blog. Definitely very useful article for everyone who want to increase social share of his or her post! I also use Tweetdis and it help me a lot. Sometimes a little change results greatly. Anyway, very moment we are learning some thing new from your blog. I love your work too! Keep up bro! You said about pay for a tweet and it remind me about the way I have used to promote for some new blog before. It’s work great. However I don’t use the service like you. That service is quite great to bring traffic from social media. I will be using it even more in the new future. Have you checked the nofollow issue? Great post man. I was wondering how you embedded those tweets within your blog post now I know how you do that. I always learn something new from you every time I come here. Thanks for teaching us these 3 untapped ways to increase our social presence. The easier we make it for people to share our content the more shares we will get. You’re absolutely right even if we ask them to share they may forget. Having that tweet already to go and all you have to do is click a button is a win-win for you and your reader. Here you are again buddy with a wonderful contribution. Thanks for showing your face on this one. Always excited each time I see you around. I love how easy it is to embed social media posts on ones articles. This of course increases engagement. Wow !! !.I love this very post.Because these days,social media optimization-SMO is on top of my list of website promotion.I have joined many retweet sites,in order to achieve this,And I’am getting results.But I feel more positive results will be achieve if one would integrate one these three methods a shown here.It’s really awesome and worth trying out. I’ve been quietly reading your posts, and thinking how I can apply your ideas to international development, specifically government transparency, accountability and civic engagement issues around the world. I hope I get to meet you some day. Your posts are really generous and appreciated from someone who doesn’t come from the business world, and trying to adapt some ideas to the public interest/governance field. I often see other bloggers to do this, especially embed via Google+, whenever I see it, I always wonder how they do that. Now in this article, I already know how it works. Thanks so much for this, Enstine. Thanks for contributing in my learning curve as well. Thanks for really good tips here. I often share my posts through social button by plugins (I’m using WordPress). I have a question, are they different? You are right dear, No doubt, Social sharing is really great way to pull lots of traffic. Enstine, I never think about these tricks, really amazing but I want to try these method to increase my social sharing. I hope these tricks will help me a lot. Nowadays SMO has become the best way to attract more and more traffic to our website. Enstine, once again you have posted information on topics I knew nothing about. Am I going to try some of these tricks? Looks to me as if you’ve ticked all the right boxes here! lol all boxes were tiked so I guess you are already working on them.